The willy nilly silly old bear is back in “Winnie the Pooh,” a charming one-hour production that’s tailor-made for children at Adventure Theatre MTC. The musical runs through May 26, 2019, at the theatre in Glen Echo Park. Get ready for a lot of cutesy words here because that’s what this production was—gosh-darn cute, starting with the scenic design by Nephelie Andonyadis. It probably took a lot of restraint from the dozens of children in the audience (and maybe some of their parents, too) not to hop up on the platform—which looked incredibly solid and well-put together—that was reminiscent of playground equipment, dive into the sandbox-like pool, or crawl through an exposed tunnel leading to a backstage area. Seize the opportunity to cultivate an early love of theatre in your littlest ones by taking them on a trip to Hundred Acre Wood. “Winnie the Pooh,” directed by Shirley Serotsky, includes a number of familiar antics from the gang at Hundred Acre Wood, much to the delight of the youngsters that are undoubtedly the target audience for Adventure Theatre MTC. Eeyore (Sally Horton, who also plays Kanga) has lost his tail, of course, and Pooh (Derrick Truby Jr.) has gotten his head stuck in a honey jar. The story isn’t stale, though, thanks to the charm of the cast (which also includes Billie Kirshawn as Piglet, Roo, and Owl and Stephen Murray as Christopher Robin and Rabbit), the script, and the short songs that are interspersed throughout. Adventure Theatre MTC is dedicated to educating and inspiring new generations of theatre artists and audiences, and productions such as “Winnie the Pooh” does a phenomenal job of doing just that for the youngest patrons. Seize the opportunity to cultivate an early love of theatre in your littlest ones by taking them on a trip to Hundred Acre Wood with “Winnie the Pooh” at Adventure Theatre MTC. “Winnie the Pooh” runs through May 26, 2019, at Adventure Theatre MTC in Glen Echo Park. For more information or to buy tickets, visit Adventure Theatre’s website. 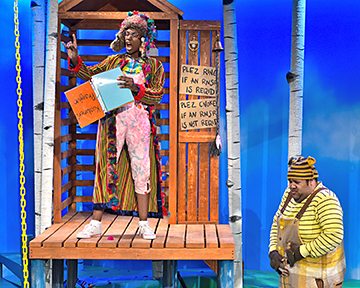 A sensory-friendly and ASL-interpreted performance of “Winnie the Pooh” is scheduled for 4:30 p.m. Saturday, April 13, 2019. Kelsey Casselbury is a freelance writer and editor based in Odenton, Md. She has a degree in journalism with a minor in theatre from The Pennslyvania State University. Her love of musical theatre led her to sing and dance her way through middle and high school; she now serves on the Board of Directors for Children's Theatre of Annapolis.